Following the release of Pope Benedict’s motu proprio Summorum Pontificum, the Church has witnessed an increasing number of priests offering the Traditional Latin Mass, or what is now called the Extraordinary Form of the Roman Rite. As I have discussed previously, an entire generation of ordained and lay faithful are rediscovering the sacred beauty of our liturgical heritage. While many Catholics still primarily experience a Low Mass when assisting at the Extraordinary Form, more of the faithful are being introduced to the ritual grandeur of the Solemn High Mass. One aspect of this Mass which immediately differentiates it from the Ordinary Form familiar to most is the role of the subdeacon within the liturgy. 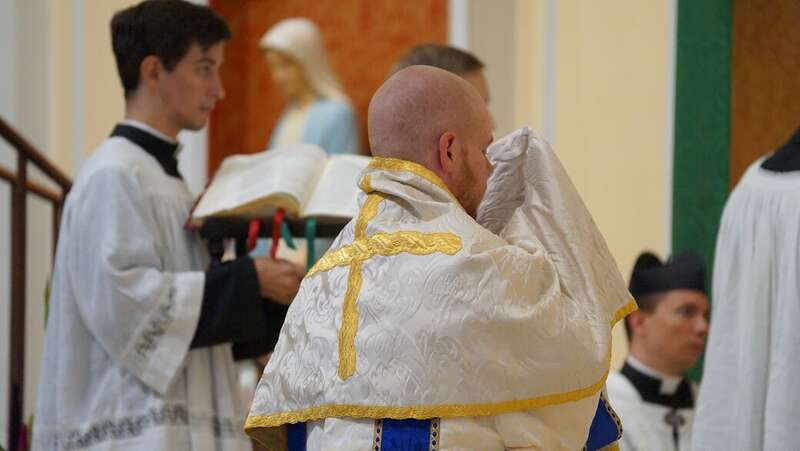 The roles of a subdeacon at Solemn High Mass include the chanting of the Epistle, holding the Gospel book while the Deacon chants the Gospel, and assisting the deacon in serving the priest at the altar. The subdeacon brings the chalice to the altar at the Offertory while wearing the humeral veil. He continues to wear it while holding the paten during a large part of Solemn High Mass, from the Offertory to the Our Father. It is this ancient liturgical practice, replete with its timeless mystery, that catches our attention. The subdeacon, wrapped in the humeral veil, holds the paten before his eyes, thereby obstructing his vision of the altar. This practice, dating back centuries, is understood to hold multiple significations. This hiding of the paten has many significations, as the hiding of the apostles during the passion of our Lord; the hiding of our Lord’s divinity under the veil of his human nature, especially during the Passion; the blindness of the Jews who would not receive Him for the Promised One, and would not see Him, though present before their eyes. At the words, “Forgive us our trespasses,” the sub-deacon uncovers the paten, and takes it from before his eyes, so he can see the altar, and this is a figure of the vision to come to the Jews towards the end of the world, when they shall see the truth, our Lord Jesus Christ, and believe in Him. Indeed, there is no shortage of interpretations for this ancient practice within the Traditional Mass. Sometimes it makes no difference as to which understanding of a ritual is most true to the original intent; rather we might simply take satisfaction in accepting that Holy Mother Church has seen value and purpose to a particular liturgical action for an untold number of centuries. Something to ponder the next time you are blessed to hear a Solemn High Mass.